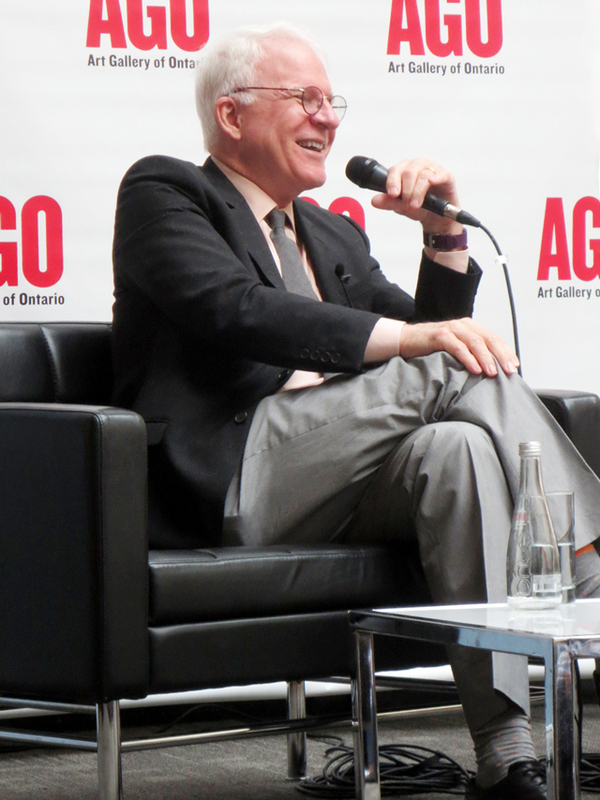 It was exciting to see and hear comedian and actor Steve Martin speaking at the AGO last week. 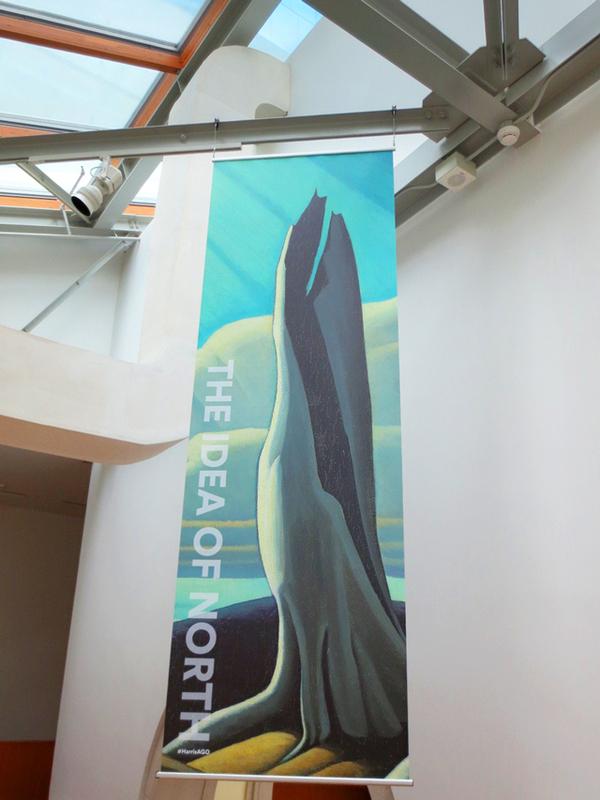 He was in Toronto to discuss the exhibition, "The Idea of North : The Paintings of Lawren Harris", which opened at the gallery on the weekend and runs through to September 18th. 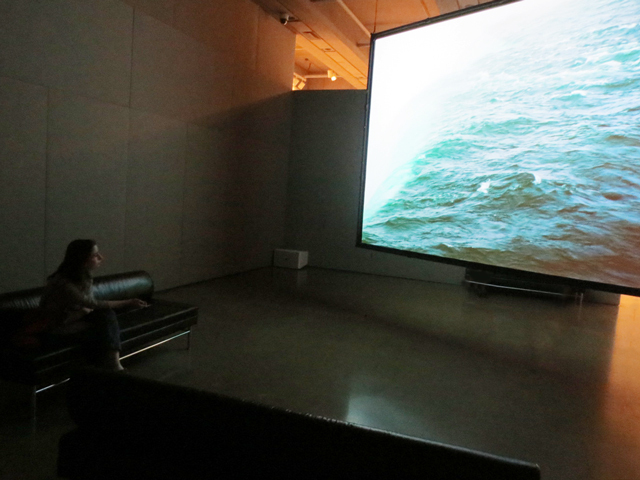 The show, curated by Steve Martin himself, is in the city after recently being displayed in Los Angeles and in Boston. In addition to being a popular performer, Steve Martin is a lover and collector of art, which would help to explain his involvement in this show, but it goes beyond that -- he is passionate enough about this particular painter to have spent the last three years on the project, traveling far and wide to view Harris' paintings in person and the selecting exactly which pieces would be included in the show. 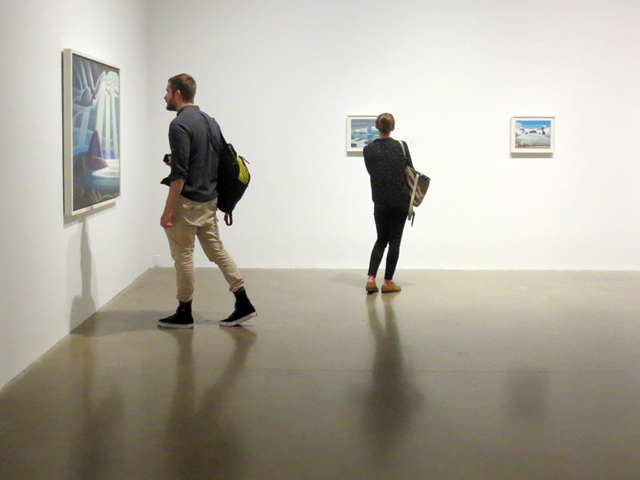 He also participated in setting up the three shows, deciding where each painting would be hung. His interest in Harris first began after he saw a picture of one of his iceberg paintings in a book. At the event on Tuesday, he spoke about thinking that he'd discovered this artist. Then he saw that Harris' paintings were selling for over a million dollars a piece, and realized that, while this painter might not be well known outside of Canada, he had not, in fact, discovered him. So, he made it his mission to help get the word out about an artist whose work he greatly admired to American audiences and beyond. 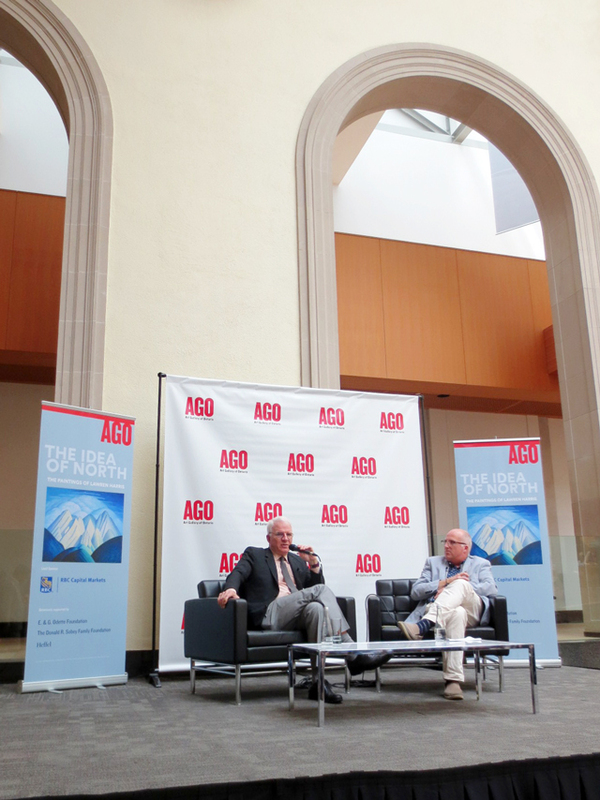 The event was held in the gallery's Walker Court and was set up as a sit-down conversation about Lawren Harris and his art, between Steve Martin and the art gallery's curator of Canadian Art Andrew Hunter. This was followed by a few questions from the audience. After the talk, we were invited to take a tour of the show. As a young boy, Lawren and his family, which included a brother and two sisters, moved to the affluent neighbourhood of Rosedale. He was unwell as a child and stuck in bed, where he was given pencils and paper to keep himself occupied, thus sparking his interest in creating art. As a teen he went to high-school at Central Tech (Nowadays, that's the school on Bathurst Street at Huron, built in 1913 (previously photographed for this post), but at the time Harris would have attended, it had taken up temporary residence in the Stewart Building, built in 1984 and located at 149 College Street near University Avenue. That building, which is now part of University of Toronto, had originally been build to house a state-of-the-art exercise facility for men, which ran into financial difficulties shortly after opening, so it was sold to the Technical School Board. Apparently, Toronto's first indoor swimming pool was in that building, and when the school moved in, the art rooms were set up inside the emptied out pool. 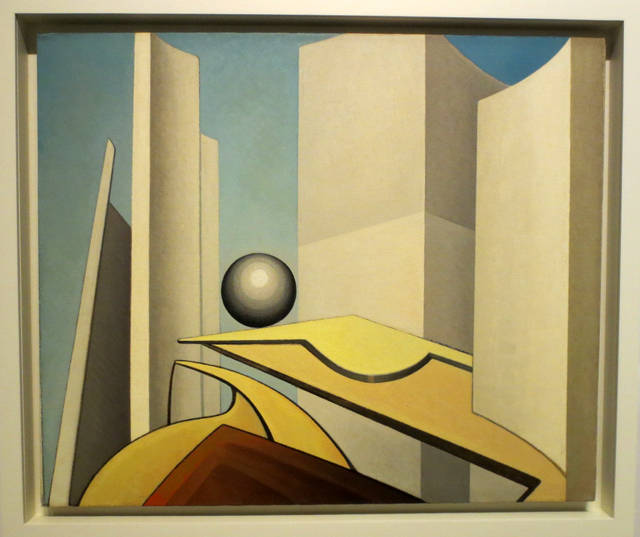 So, Lawren Harris' early education in art would have taken place inside a swimming pool. He didn't take to high school though, and quit after grade ten. Then, at the age of 19, he traveled to Berlin to study art and philosophy, which he did for three to four years. This would have been from 1904 to 1908. At that time, travelling across the ocean was done in the earliest of steamships, probably departing and returning from Montreal, with the passage taking about 4 days. Being wealthy, he would have been in the first-class section of the ship -- to put it in perspective, this was several years before the Titanic sunk in 1912, and his accommodations on the boat would have been much like Kate Winslet's Rose were in the movie. 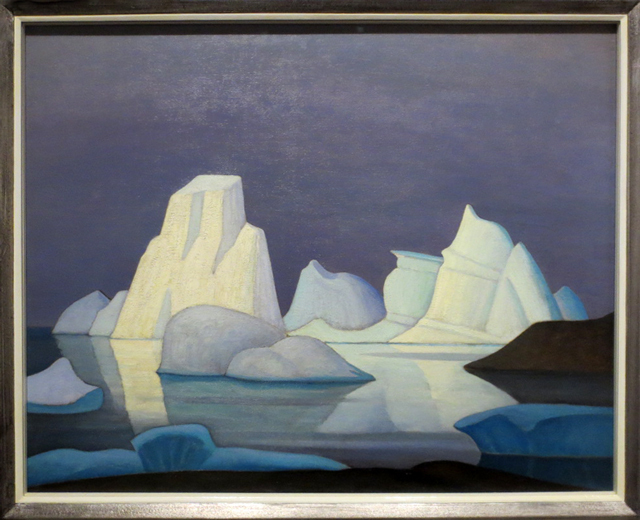 It is very likely that Lawren Harris saw icebergs from the deck of the ship, perhaps influencing his future art. Upon his return to Toronto, in 1910, he married into a similarly wealthy family at the age of 25, and he and his wife Trixie went on to have three children. 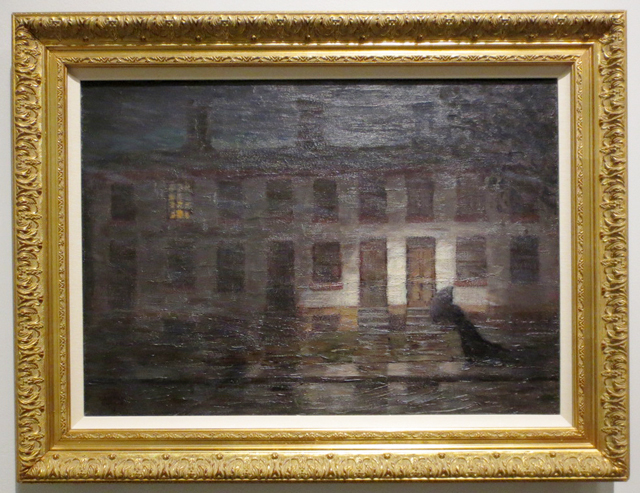 The earliest painting hanging in the show was created the year after he was married, in 1911. It is of The Eaton's Manufacturing building (shown below), and depicts one of Toronto's first tall buildings, located between Bay and Yonge where the southern part of the Eaton Centre is now. 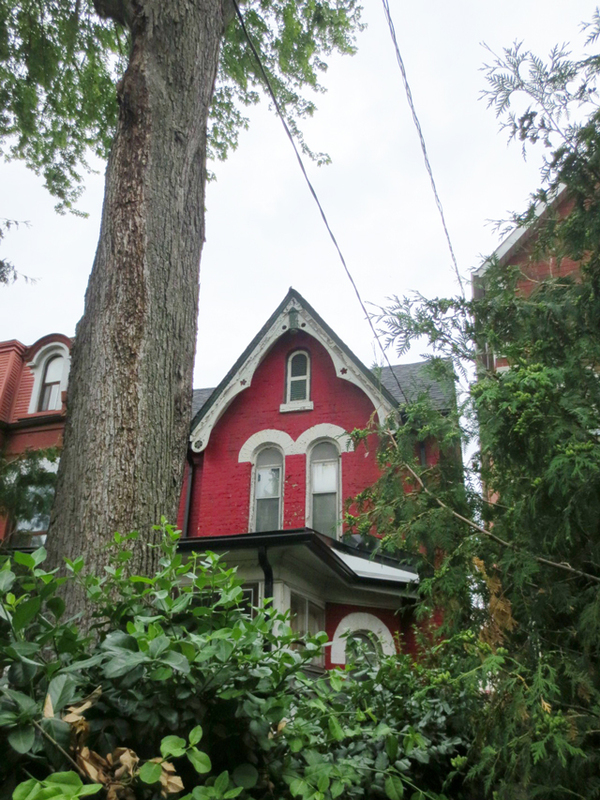 At the time Toronto neighbourhoods were divided into wards, and this building was located in what was called St. John's Ward (later called simply "The Ward") which extended from University to Yonge and from just south of Queen St. W. and just north of College. 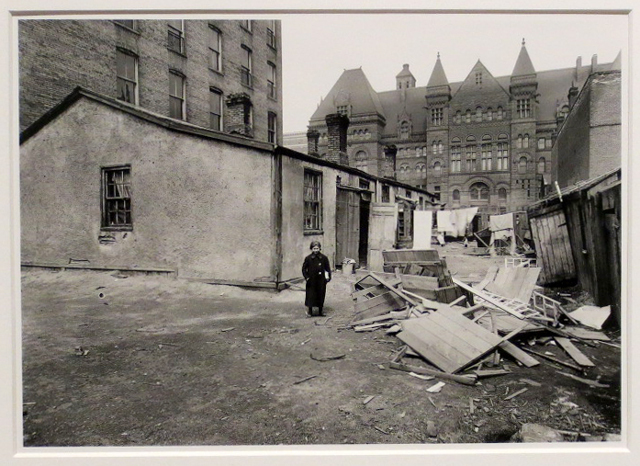 This was one of the city's poorest wards, an area where many of the newly arrived immigrants, which included a significant number of African American fugitive slaves and Europeans, were packed into ramshackle housing. Given that Harris spent the next 13 years or so painting scenes from within The Ward, it was a place that held great interest to him. Harris joined the army in 1916, and took part in the first world war. Sadly, his only brother died in the war and Harris was said to be discharged after suffering a breakdown. He returned to Toronto, with the experience of those years inevitably effecting him deeply. 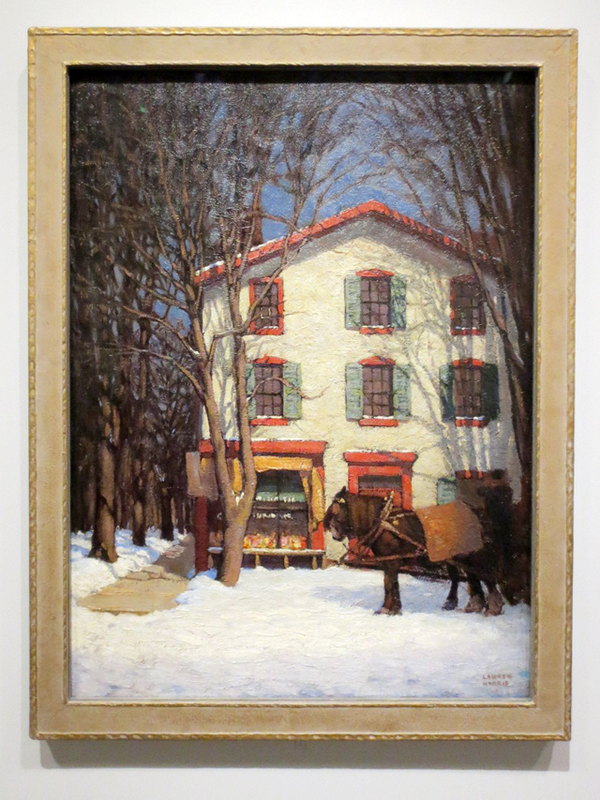 In 1920, when Harris was 35, he met a female painter, the wife of a friend, named Bess Housser. Apparently they met when she posed for a portrait. I can't say exactly when it happened, but she and Harris fell in love. However, in an effort to avoid the scandal associated with divorce back then, they each remained married to their respective spouses. 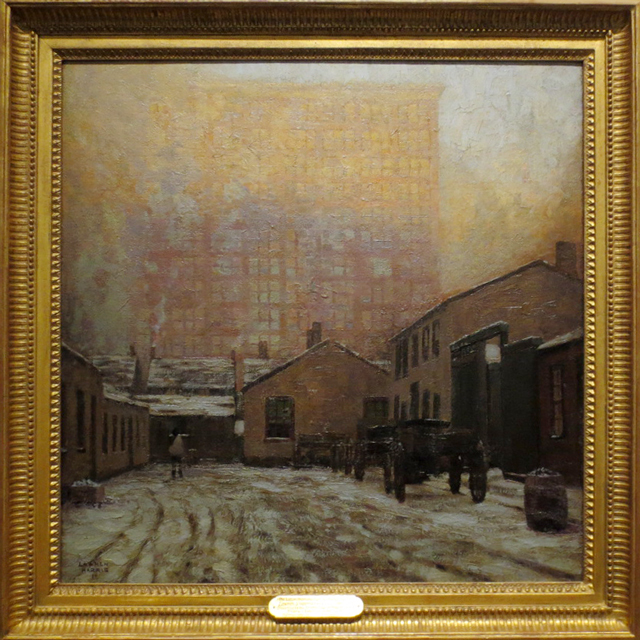 This next painting, called "Grey Day in Town", is interesting because, while it was first painted in 1923 during his "The Ward" period, he came back to it and reworked the snow in the early 1930s. The painting is a bridge between two of Harris' artistic periods, as by the time he reworked it, he'd begun his extensive travels to the north, and embarked on a new style of painting which concentrated on stark landscapes with plenty of snow and ice. 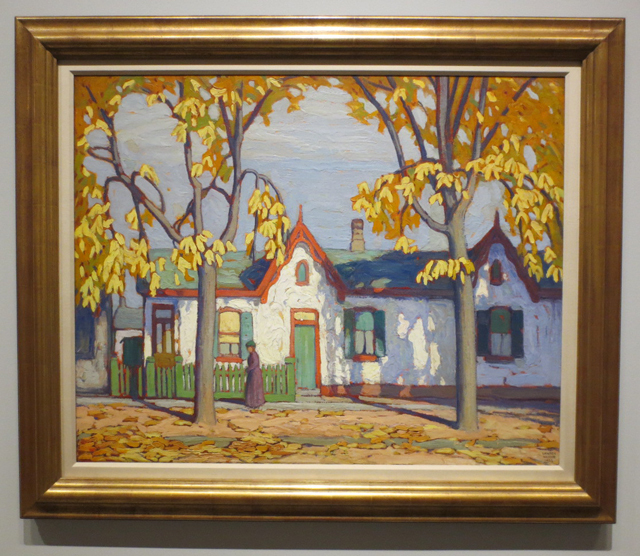 Harris' paintings of the old Toronto houses are personal favourites. 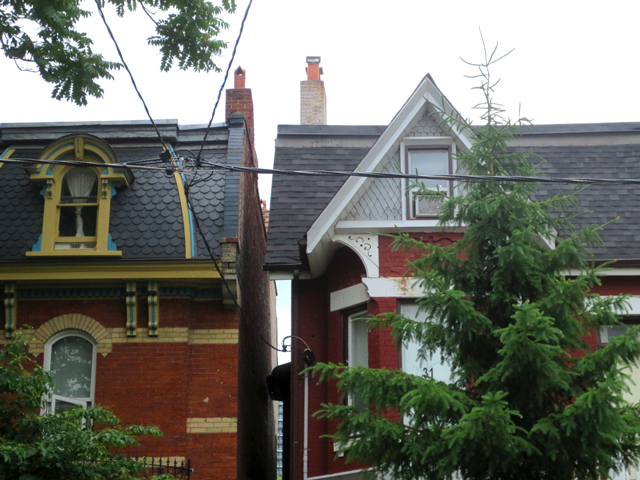 While most everything within The Ward was torn down beginning in the 1920s, to make room for the office buildings, hospitals and city hall, which are there now, you can still find many houses in neighbouring wards that look just like what Harris painted. 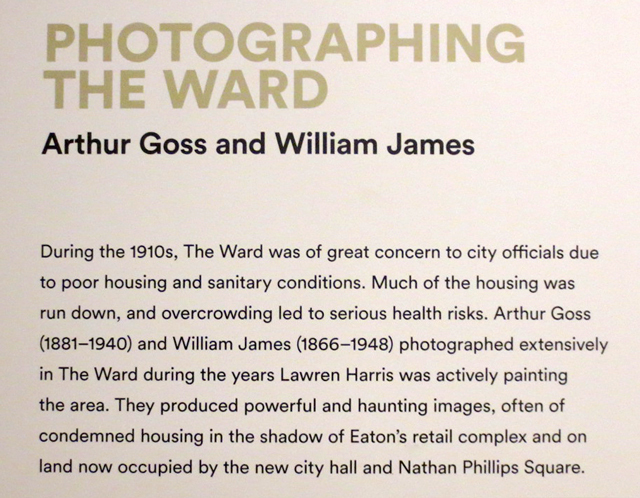 Included in the exhibition are some historic photographs, taken by Arthur Goss. I often look at old pictures of the city online, so really appreciated seeing some printed up and framed. While Harris first chose a poor neighbourhood as the main subject for his artwork, he was wealthy and lived an upper-class lifestyle. This included being a member of the Arts and Letters Club of Toronto, where he met six other painters. He and his friend JEH MacDonald formed the Group of Seven with them. 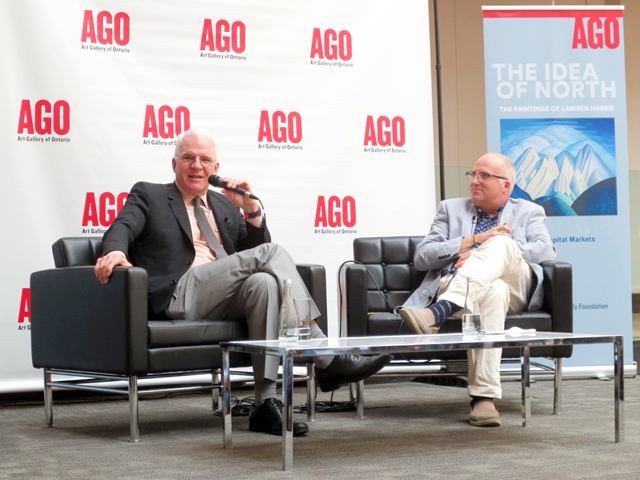 He had the means to finance trips to the countryside and the far north for the group, where they created their iconic Canadian Landscape paintings. I read that he bought a heated train-car that the group used as a studio/accommodation while they were on these trips. They would just arrange to have it hitched up to whatever engine was going their way. They traveled at least once a year, all over the Canadian north. Harris' methods included painting drafts of what he saw, on thin wooden panels, which acted as sketches, that he brought home and used as the basis for his larger canvases. The finished paintings didn't reflect a specific sight that he had seen but rather was made up of elements of different scenarios. For example, in regards to the next painting featuring the tree stump -- apparently, he'd come upon it in a wooded area, without the view of Lake Superior that he included in the painting. He made up the scene by placing the stump in front of the lake. At one point, Harris was accused by Canadian politicians of being bad for the country and discouraging immigration to the country. It was thought that he was painting the county in a bad light, by making the housing in Toronto look shabby, and the country in general appear to be cold and uninviting. This was actually discussed in legislature. 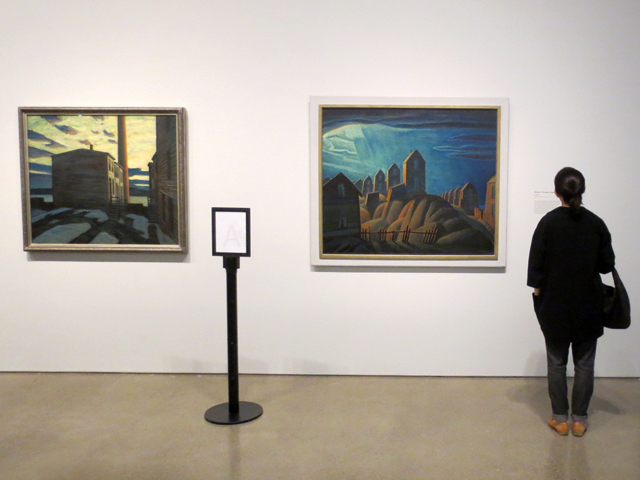 The Group of Seven traveled and painted together for the next 10 years or so, disbanding sometime in the mid-1930s. 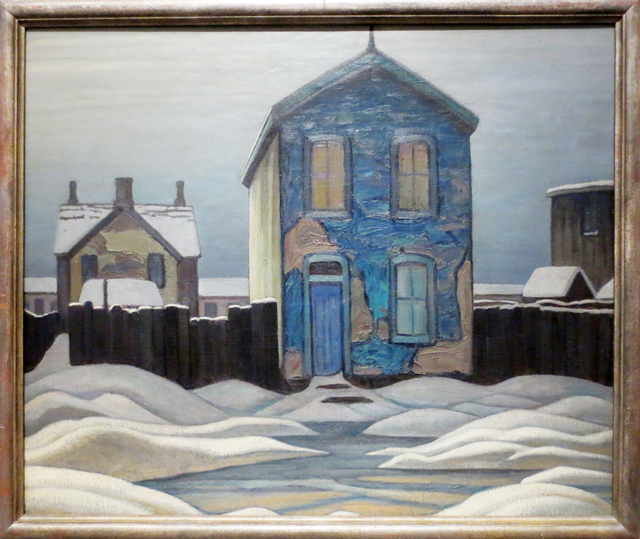 By then Lawren Harris was in his late-40s. Today, his paintings from The Ward and The North sell at auction for record breaking prices. 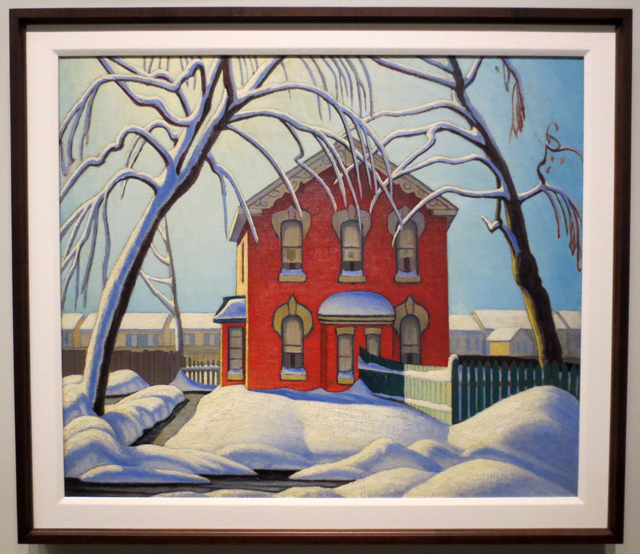 Only last November two sold at an auction in Toronto for $3.1 million and $3.9 million. In 2005, one of his paintings called Algoma Hill was sold at a Sotheby's auction for $1.38 million. It had been stored in a closet of a Toronto hospital for years, having been forgotten about until cleaning staff found it. Imagine being the person who found that! I'm sure the proceeds would have gone to the hospital, but still. 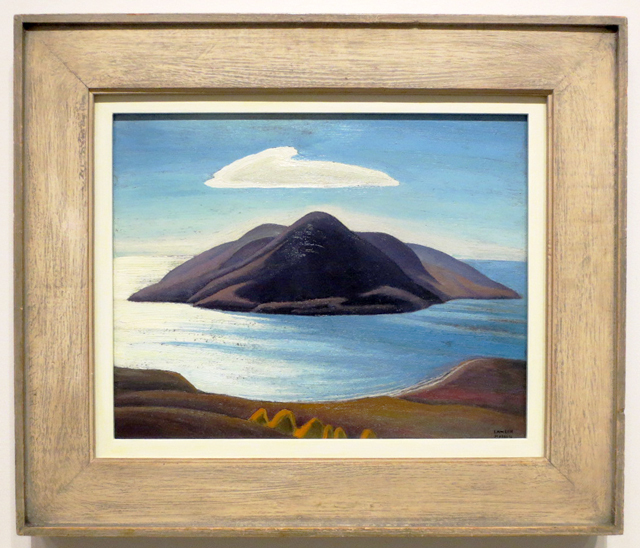 I'm not sure if the catalyst for the coming apart of the Group of Seven was the fact that his friend and fellow co-founder of the Group of Seven JEH MacDonald died in 1932, or the fact that, in 1934, he and his true-love Bess Housser divorced their spouses and married one another. I suspect it was probably a combination of the two. The marriage caused such an uproar, with his former wife's family threatening to charge him with bigamy, that he and Bess left the country and moved to the United States. They lived in New Hampshire for a couple of years, and then in Sante Fe for about four years, returning to Canada in 1940. They chose to settle in Vancouver on the west coast though, far away from Toronto. It was during this time that Harris shifted to his third style of painting, abstract, which he did with great dedication but little public appreciation for the rest of his life. 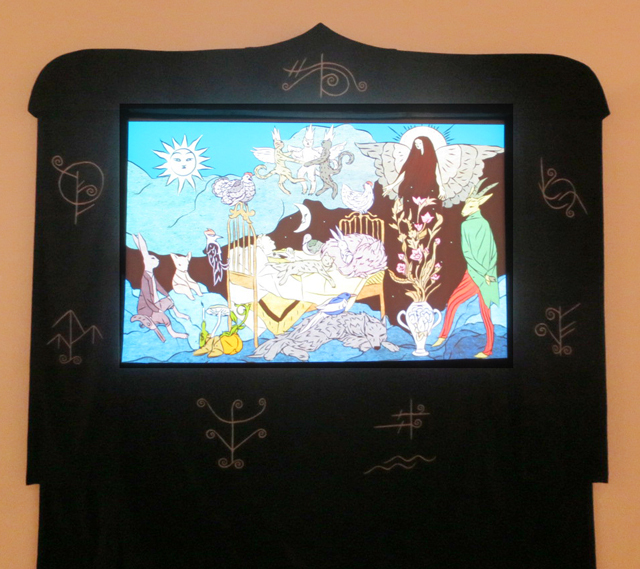 Interspersed throughout the show, are contemporary artworks by Canadian artists, including Nina Bunjevac, Jennifer Baichwal and Nick de Pencier, Tin Can Forest and Anique Jordan. Bess Housser died in September, 1969 and Harris died very shortly after, within four months, in January 1970, at the age of 85. 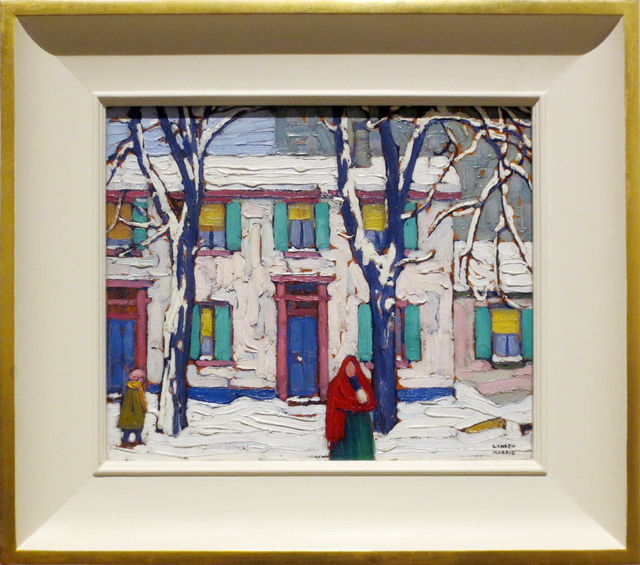 Lawren Harris continued painting every day until his death, with a family member helping him to his easel for short periods at the end, when he could no longer get there himself. 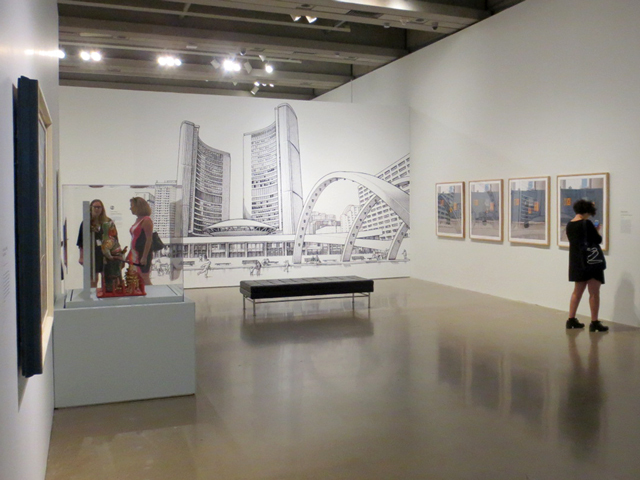 I hope you can make it to this breathtaking show at the AGO. Tickets are available on their site here. Again, it will be hanging until mid September, so there's plenty of time although you'd want to get your tickets in advance in case they sell out. Seeing all that snow and ice will be a welcome reprieve on the hot summer days! 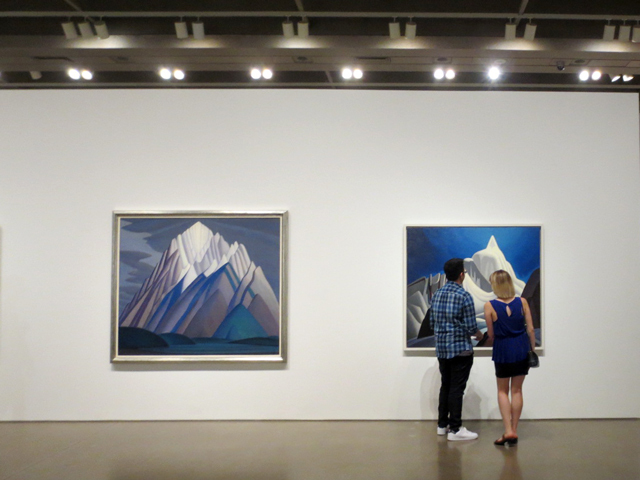 If you can't see this special show, there is a room dedicated to Lawren Harris at the gallery, containing many paintings that are part of the AGOs permanent collection. I went to have a look to see if it is still intact during the exhibition, and in deed, it appears to be. Also, right beside that room, there's one filled with paintings by the Group of Seven, so you can get your fill of Canadian landscapes. 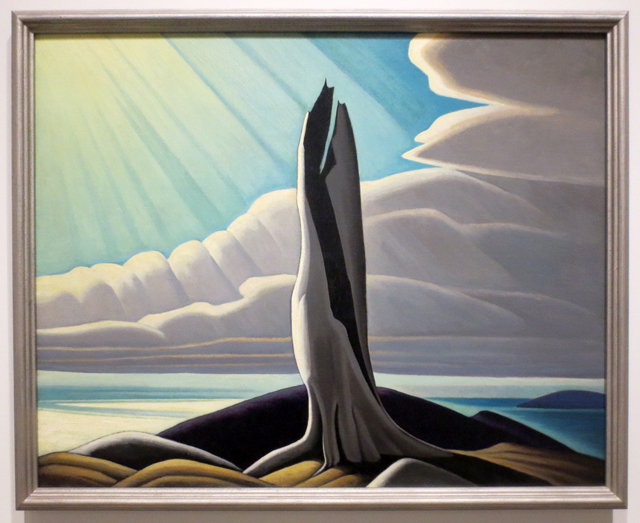 If you'd like to watch an hour-long documentary about Lawren Harris, there's a newly released one on TVO available for viewing here. The gallery has set up a really lovely gift shop in association with The Idea of North exhibition. I plan to do a dedicated post to show you that soon! I must go before it ends! 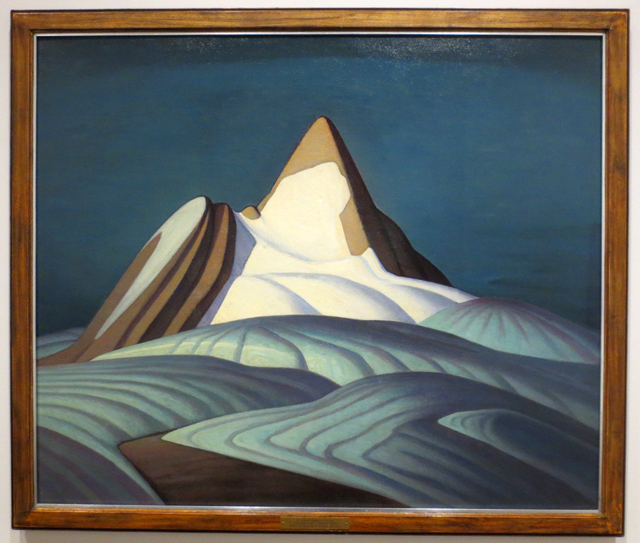 Really like the Lawren Harris paintings. Many years ago I went to see the McMichael collection and his paintings remind me of what I saw there – or maybe of what I liked best there???? ooh, your review of the show makes me even more excited to see it, I can’t wait! The early works are ones I have definitely never seen. 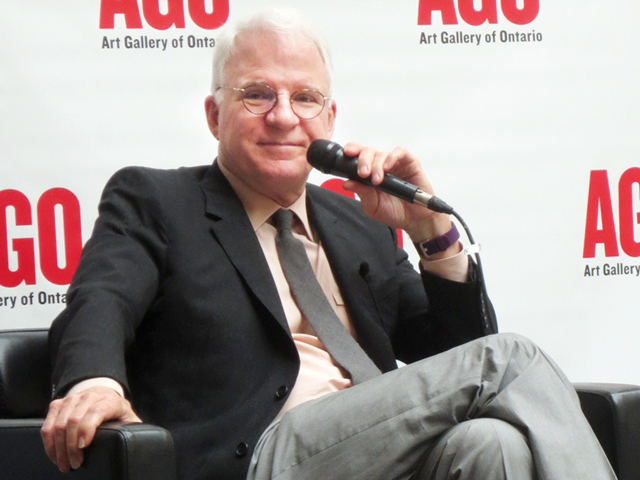 I was so glad to have seen Steve Martin in conversation about the exhibit, he was so funny and affable. thank you for such an incredible and in depth review! What a fantastic an interesting event! The pieces look so beautiful!